Ned Lander is an independent filmmaker. He is currently producing a telefeature Dangerous Remedy, a true-life crime drama about a Scottish Australian doctor who took on corrupt police who were profiteering from an illegal abortion racket in Melbourne Australia in 1969. He is also co-producing a feature documentary Make Hummus Not War – filmed in The Palestinian Territories, Lebanon, Israel, London, New York, Sydney and Melbourne. 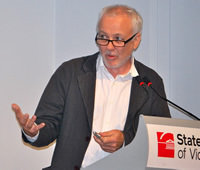 From 2001 to 2009 Ned Lander worked at SBS Television (Australia's second national broadcaster) as Senior Commissioning Editor Factual, Deputy General Manager SBS Independent (SBSi) and then General Manager SBSi - responsible for all Australian commissioning. In these roles Lander oversaw around a thousand hours of television of all genres including the innovative multicultural police drama East West 101 (about an Australian Muslim Major Crime Detective, East West 101 has been purchased for broadcast by both the Arab Territories and Israel) and The Circuit. Whilst Senior Commissioning Editor, Factual, Lander commissioned documentary programs as diverse as the living history series, The Colony and a three part essay on Australian families, Divorce Stories. Ned has also commissioned multi-award winning authored documentaries on controversial political subjects such as The President Versus David Hicks and Dying To Leave (about people smuggling and human trafficking across the globe). Lander was the Commissioning Editor of landmark projects for SBS such as the epic Indigenous history series, the First Australians (together with a content rich interactive site www.firstaustralians.com.au), the Australian version of Who Do You Think You Are? and international co-productions such as Darwin's Lost Paradise with ZDF/Arte. As an independent filmmaker Ned has written, directed and produced award winning drama and documentary. He produced the feature film Radiance nominated for Best Film and won Best Actress (Deborah Mailman) at the 1999 AFIs, it screened at Toronto, London, The Hamptons, Wellington, and Vancouver International Film Festivals. Radiance was released nationally by Universal and was distributed internationally by Beyond Distribution. Lander directed and co-produced 50 Years of Silence (about the first European woman to speak out about her treatment by the Japanese military as a 'Comfort Woman'. 50 Years of Silence was broadcast on the ABC locally, Channel Four UK and over 30 other countries. It won a Logie and the AFI Award for Best Documentary in 1994. He directed the AFI Award winning feature film Wrong Side of The Road and produced the four-hour docu-drama series Blood Brothers. Ned directed two episodes including Broken English starring Hugo Weaving, Noah Taylor and Indigenous actor Lawrence Turner. In 1987 he produced the ABC tele- feature Bachelor Girl for Rivka Hartman and co-produced the one-hour documentary for director Trevor Graham, Painting The Town about artist Yosl Bergner, winning the AFI for Best Documentary.